To Cite: Yousef Abadi H A, Mirzaei B, Habibi H, Barbas I. Prevalence of Rapid Weight Loss and Its Effects on Elite Cadet Wrestlers Participated in the Final Stage of National Championships, Int J Sport Stud Hlth. 2018 ; 1(1):e64316. doi: 10.5812/intjssh.64316. Objectives: The aim of this study was to investigate the prevalence of rapid weight loss (RWL) and its effects on elite cadet wrestlers participated in the final stage of Iran national championships. Methods: The wrestlers comprised of 56 adolescents (25 freestyle and 31 Greco-Roman wrestlers). They were divided into three weight groups including light (50.80 ± 5.27 kg), middle (63.74 ± 4.94) and heavy weight (88.26 ± 10.51 kg). Their mean age were 16 ± 0.72; 16.82 ± 0.63 and 16.42 ± 0.69 years) respectively. Prevalence of RWL and its effects were assessed using the standard Oppliger questionnaire. In addition to the extracted data from questionnaire, wrestlers’ body weights were measured in the morning of competition day and its difference with the weight at the weigh-in time was calculated as a marker of their normal body weight. This index was applied for the first time in Iran and all the wrestlers participated in this part of investigation. Results: The maximum weight loss (MWL) among light, middle and heavy weight groups were 3.95 ± 1.31, 4.47 ± 1.53 and 5.07 ± 1.32 kg respectively. The results suggested that the rate of weight loss in light, middle and heavy weight groups were 3.09 ± 1.56, 2.64 ± 1.34 and 2.12 ± 1.41 kg respectively. The results indicated that increasing the level of physical activity in order to achieve ideal body weight besides the gradual dieting was the most prevalent method for weight loss, and dizziness, muscle cramp and irritability were respectively the most frequent side effects caused by RWL. Conclusions: Being aware of common ways used for weight loss among wrestlers can help coaches and athletes do the weight loss process more effectively. Nowadays, Sports have attracted millions of spectatiors worlwide especially those which are hold at olympic games. In this regard, combat events are more fascinated worlwide in a way that 25% of the Olympic medals are devoted to combat sports (1). In essence, Combat-sport athletes take part in weight classes so the matches are more equitable in terms of body size, strength and agility. However, many of combat sport athletes tend to experience extra weight loss shortly before weight-in and/or competition for achievng competitive advantages by competing against a lighter and weaker opponant. The use of RWL methods in these kinds of sport has long been a matter of concern and may even be used by children and adolescents (1). since most wrestlers who experince championship are in prepuberty statues, thus, they are more vulnarable to be affected negatively by poor nutrition as a result of both food deprivation and low fluid intake (2) and experience growth impairment (1). It must be noted that intervening RWL techniques for competitive wrestlers have caused a great deal of concern especially after occurrences of three tragic deaths in 1997. Hence, some organizations such as The National Collegiate Athletic Association (NCAA) and the national governing body of USA decided to institute new policies to prohibit unsafe weight loss practices. However, no prohibiting policies have been adopted for Greco-Roman and freestyle wrestling in international events. The effects of rapid and intensive weight loss on wrestlers’ performance and health has been interests of researchers since a few decades agob (3). Since 1970, numerous studies have been conducted to document weight management patterns among high school and college wrestlers. The American Medical Association and the American College of Sports Medicine published one and two position statements respectively in order to advocate against these unhealthy weight loss practices (4). In many cases, wrestlers attempt to lose lots of weight in a short time by food and fluid restriction. Intense exercises, vomiting, starvation and use of diuretics and laxatives are other methods commonly ued by wrestlers (3). In a study, Mirzaei et al. investigated the methods of RWL in Iranian elite wrestlers (cadets, juniors and seniors). The results showed that the most frequent methods in wrestlers consisted of fasting, high intensity exercise, removing one meal, exercise in heated rooms, saunas and rubber/plastic suit, while they never used extreme methods of weight loss (vomiting, diuretics, laxatives and enemas) (3). The RWL techniques using by wrestlers have changed a little over the past 25 years, because it has been shown that these techniques pass down from wrestler to wrestler, or coach to wrestler. parents and health professionals are not appropriately aware of how to lose weight effcetively and safely (5). Unfortunaltly, combination of these methods are frequently used in the day before competition. either combined methods or single one cause the harmful effects on cardiovascular functions, thermoregulation, renal function, fluid and electrolyte balance, body composition and muscle strength/endurance (2). In addition, the effects of repeated cycles of weight loss and weight gain during competition season affect mood profile, impaire short and long memory and is also associated with obesity in long time (3). Weight loss in wrestlers is mostly accompanied body water reductions, glycogen depletion, lean tissue declince, and only a small amount of fat. In addition, dehydration methods, e.g., sweating and catharsis, cause the loss of electrolytes (4) replenishment of body fluids, electrolytes, and glycogen in the short period between the weigh-in and competition is of utmost importance for reseachers. However, reestablishing fluid homeostasis may take 24 - 48 hours; replenishing muscle glycogen may take more than 72 hours, and replacing lean tissue might take even longer. Briefly, RWL appears to adversely influence the wrestlers’ energy stores and fluid and electrolyte balances (1). Therefore, it is important to study and diagnose the RWL practices which can cause negative impacts on physical and psychological health. In addition, it is necessary to understand the nutritional behaviors of wrestlers. On the other hnd, RWL and its negative effects haven’t been investigated comprehensively in Iranian elite cadet wrestlers. As a result, the objective of this study was to investigate the prevalence of RWL and its effects on Iranian elite cadet wrestlers participated in the final stage of national championships. The subjects were Iranian elite cadet wrestlers (with mean age of 15 to 17 years) from different states of Iran, participated in last stage of national championships in 2016. Fifty-six adolescents (25 freestyle and 31 Greco-Roman wrestlers) from mentioned population participated in this study voluntarily. Rapid weight loss data was collected by using Oppliger (4). The validity of the questionnaire was confirmed by the University of Northern Michigan and the its validity was determined by Mirzaei et al. in Iran (2). Oppliger questionnaire consists of four parts. The first part contating 7 questions include the wrestlers’ personal information such as age, normal weight, competitive weight, age category, wrestling style (freestyle or Greco-Roman) and their wrestling background. The second part includes 17 questions which assess the dietary history and dietary patterns of wrestlers. The third part includes 3 questions that investigate the methods and the effects of RWL. The final part of questionnaire consists of four question assessing the sources of information on weight cutting (3). The consent forms were signed Before The study by subjects and they were completely explained about the study procedure by experimenter. Kruskal-Wallis and Mann-Whitney were used to analyze the data. The general characteristics of subjects are presented in Table 1. Abbreviations: HWG, Heavy Weight Group; LWG, Light Weight Group; MWG, Middle Weight Group. Based on the results, 60 percent of LWG, 41.2 percent of MWG and 52.6 percent of HWG wrestlers imagined that they are overweight. Likewise, the most frequent of rapid weight loss included gradual dieting, increased exercise and omitting one meal. Furthermore, none of them used ultra methods such as vomiting, enemas and use of diuretics or laxatives (see Figure 1). There were no significant differences between different weight groups of Iranian elite cadet wrestlers in using of RWL methods except taking diet pills. The post hoc test indicated that HWG took diet pills significantly more than MWG (P < 0.05). According to the results, LWG, MWG and HWG wrestlers had a history of avoiding eating for 1.32 ± 0.74, 1.20 ± 0.30 and 1.47 ± 0.51 (day) respectively with no significant differences among them. The most common side effects of RWL are seen in Table 2. The rate of weight loss in weight, percentage and frequency is seen in Table 3. The Maximum weight loss was not significantly different in three weight groups. However, a significant difference was observed in frequency of cutting weight between LWG and MWG which showed MWG cut weight more times compared to the LWG (P < 0.05). The results showed that coaches were the major Counselor for weigh loss in wrestlers while, physicians, medical assistants and other sources of informarion (media, internet etc.) had no role the same as coaches (See Table 4). 20% of LWG, 35.5% of MWG and 26.3% of HWG measured their body composition in last year and 10, 11.3 and 5.8% of LWG, MWG and HWG wrestlers took advantageous from body composition data to lose weight more effectively. Wrestlers’ body weights were measured in the morning of competition day and its difference with the weight at the weigh-in time, as a marker of their normal body weight, was calculated (Table 5). The maximum weight loss (MWL) among light, middle and heavy weight groups were 3.95 ± 1.31, 4.47 ± 1.53 and 5.07 ± 1.32 kg respectively. The results suggested that the rate of weight loss in light, middle and heavy weight groups were 3.09 ± 1.56, 2.64 ± 1.34 and 2.12 ± 1.41 kg respectively. The results indicated that increasing the level of physical activity besides the gradual dieting was the most prevalent method for weight loss, and dizziness, muscle cramp and irritability were respectively the most frequent side effects caused by RWL. It was shown that wrestlers often use RWL methods to achieve competitive advantage by competing against a lighter and weaker opponant but it seems that RWL have side effects too. For instance, Pettersson et al. (2013), reported that athletes using RWL before the competition had more self-confidence (6). The beginning age for RWL in this study was 14.05 ± 1.57 years which was lower than the result of Mirzaei et al. (2), 15.50 ± 0.98 years and greater than results reported by Viveiros et al. (7), and Artioli et al. (8), 12.1 ± 1.3 and 12.6 ± 6.1 years respectively. These differences can be attributed to the different number of subjects with different sexuality. The present study found that the most frequent method for RWL used by Iranian elite cadet wrestlers were gradual dieting, intensified exercise training and omitting one meal Which was in agreement with Amirsasan et al. (2013), Mirzaei et al. (2011), Khodaee et al. (9), James and Shirreffs (10), Werner et al. (11), Brito et al. (12), Artioli et al. (8), Pettersson et al. (6). It was also suggested that ultra-methods such as enemas, diuretics, laxatives and vomiting were not used by athletes. Dizziness, muscle cramp and irritability had the most prevalence in Iranian elite cadet wrestlers after RWL. Low concentration, hot flashes, increased heart rate, headache, feverish, disoriented, nausea and nosebleeds were other sighn caused by RWL respectively. In this regard, Mirzaei et al. (2011) reported that wrestlers had irritability, dizziness, muscle cramp, decreased concentration, increased heart rate, headache, disoriented, nausea, feverish, hot flashes and nosebleeds after RWL respectively. negative effects of RWL on mood was reported in a study (9). In the present study, the MWL among subjects before final stage of national championships was 4.49 ± 1.44 kg and it was 6.65% as a percentage of body weight. The amount of weight loss were 3.95 ± 1.31, 4.47 ± 1.53 and 5.07 ± 1.32 kg and percentage of wrestlers’ body weight were 7.77 (%), 7.01 (%) and 5.74 (%) respectively for LWG, MWG and HWG respectively, no significant differences were also found between groups. The average amounts of MWL in Alderman et al. (13), Brito et al. (12), and Oppliger et al. (5), were reported 5.27 kg, 7.25 kg and 5.3 ± 2.8 kg respectively, and they were greater than the obtained results of our study. These differences can be attributed to the higher average age of mentioned studies compared to the present study. The subjects of Alderman study were both cadet and junior wrestlers and in the studies of Oppliger et al. (2003), and Brito et al. (2012) the subject's age were 20 ± 1.6 and 25 ± 3.7 year respectively, while the average age of subjects in the present study was 16.39 ± 0.75 year. This association between the age and the MWL is obvious in Mirzaei et al. (2011) study that included cadet (2.72 ± 1.37 kg), junior (4.79 ± 1.48 kg) and senior (3 ± 2.08 kg) wrestlers which shows that cadet wrestlers have the least amount of MWL. The frequency of cutting weight was 2.33 ± 1.10 times in the year prior to competition, while it was 1.90 ± 1.07 (times), 2.70 ± 0.84 (times) and 2.47 ± 1.21 (times) respestively for LWG, MWG and HWGin the competion event. there was a significant difference between LWG and MWG showing that cut weight was more for MWG compared to LWG. The effective role of coaches on wrestlers’ RWL behaviors shown in this study is consistent with other studies (7, 12, 14). So, it’s necessary to optimize the coaches knowledge for having more qualified weight loss. The body weight difference of wrestlers in the morning of competition day and at the weigh-in time was recorded as a marker of their normal body weight. The results for LWG, MWG and HWG were 3.09 ± 1.56, 2.64 ± 1.34 and 2.12 ± 1.41 kg respectively. As already mentioned, this part of investigation was applied for the first time in Iran and it can provide a new area for researchers and future studies. The results of present study showed that the most commonly used methods for weight loss were intensified exercise training and gradual dieting, while the most frequent side effects after RWL were dizziness, muscle cramp and irritability respectively. It must be noted that more research are needed to make crucial drcisions in this issue. The authors appreciate all the wrestlers and coaches who cooperated with us. We also thank M.S students who helped us to collect data. The wrestling federation of Iran is also greatly acknowledged for their corporation. 1. Mendes SH, Tritto AC, Guilherme JP, Solis MY, Vieira DE, Franchini E, et al. Effect of rapid weight loss on performance in combat sport male athletes: does adaptation to chronic weight cycling play a role?. Br J Sports Med. 2013;47(18):1155-60. doi: 10.1136/bjsports-2013-092689. [PubMed: 24047570]. 2. Mirzaei B, Curby DG, Barbas I, Lotfi N. Anthropometric and physical fitness traits of four-time World Greco-Roman wrestling champion in relation to national norms: A case study. J Hum Sport Exerc. 2011;6(2). 3. Rahmani-Nia F, Mirzaei B, Nuri R. Physiological profile of elite Iranian junior Greco-Roman wrestlers. Int J Fitness. 2007;3(2). 4. Oppliger RA, Steen SA, Scott JR. Weight loss practices of college wrestlers. Int J Sport Nutr Exerc Metab. 2003;13(1):29-46. doi: 10.1123/ijsnem.13.1.29. [PubMed: 12660404]. 5. Oppliger RA, Case HS, Horswill CA, Landry GL, Shelter AC. ACSM Position Stand: Weight Loss in Wrestlers. Med Sci Sports Exerc. 1996;28(10):135-8. doi: 10.1097/00005768-199610000-00049. 6. Pettersson S, Ekstrom MP, Berg CM. Practices of weight regulation among elite athletes in combat sports: a matter of mental advantage?. J Athl Train. 2013;48(1):99-108. doi: 10.4085/1062-6050-48.1.04. [PubMed: 23672331]. 7. Viveiros L, Moreira A, Zourdos MC, Aoki MS, Capitani CD. Pattern of Weight Loss of Young Female and Male Wrestlers. J Strength Cond Res. 2015;29(11):3149-55. doi: 10.1519/JSC.0000000000000968. [PubMed: 25932982]. 8. Artioli GG, Gualano B, Franchini E, Scagliusi FB, Takesian M, Fuchs M, et al. 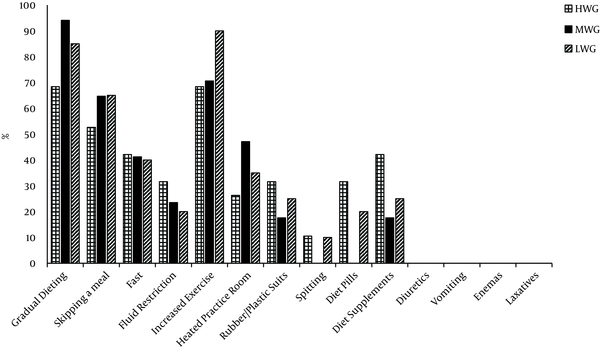 Prevalence, magnitude, and methods of rapid weight loss among judo competitors. Med Sci Sports Exerc. 2010;42(3):436-42. doi: 10.1249/MSS.0b013e3181ba8055. [PubMed: 19952804]. 9. Khodaee M, Olewinski L, Shadgan B, Kiningham RR. Rapid Weight Loss in Sports with Weight Classes. Curr Sports Med Rep. 2015;14(6):435-41. doi: 10.1249/JSR.0000000000000206. [PubMed: 26561763]. 10. James LJ, Shirreffs SM. Effect of electrolyte addition to rehydration drinks consumed after severe fluid and energy restriction. J Strength Cond Res. 2015;29(2):521-7. doi: 10.1519/JSC.0000000000000657. [PubMed: 25162651]. 11. Werner A, Thiel A, Schneider S, Mayer J, Giel KE, Zipfel S. Weight-control behaviour and weight-concerns in young elite athletes - a systematic review. J Eat Disord. 2013;1:18. doi: 10.1186/2050-2974-1-18. [PubMed: 24999399]. 12. Brito CJ, Roas A, Brito I, Marins J, Cordova C, Franchini E. Methods of body mass reduction by combat sport athletes. Int J Sport Nutr Exerc Metab. 2012;22(2):89-97. doi: 10.1123/ijsnem.22.2.89. [PubMed: 22349031]. 13. Alderman B, Landers DM, Carlson J, Scott JR. Factors related to rapid weight loss practices among international-style wrestlers. Med Sci Sports Exerc. 2004;36(2):249-52. doi: 10.1249/01.MSS.0000113668.03443.66. [PubMed: 14767247]. 14. Franchini E, Brito CJ, Artioli GG. Weight loss in combat sports: physiological, psychological and performance effects. J Int Soc Sports Nutr. 2012;9(1):52. doi: 10.1186/1550-2783-9-52. [PubMed: 23237303].